Welcome to Radians. Radians are a huge concept that really starts taking you into a new level of maths. Although, I personally find it rather simple. It is all about trigonometry. In fact it is the very core of trigonometry, only now we are going to see the whole picture. Now there are two types of angles, you have your degrees which go up to which can range from 0 to 360 in a circle. And your radians which range from 0 to 2PI. Now lets just take a look at converting Degrees to Radians and Radians back to Degrees. Lookie, a right angled triangle! Now this is a unit circle, as you can see, it has a radius of 1 unit. 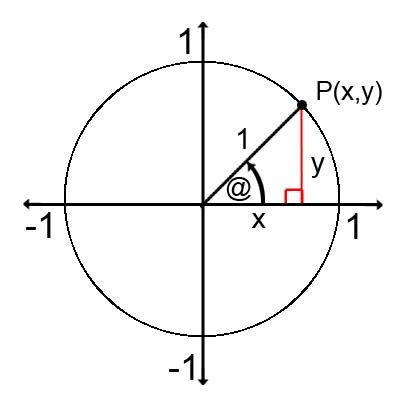 So lets start taking a look at how we can find point P on that diagram. !! We have our x position from our camera class in OpenGL !! !! We have our y position from our camera class in OpenGL !! And now you have your point P. Simple isn’t it. One Response to "7. Maths Radians"